The Jaypee Group is a diversified infrastructure conglomerate in India with interests in Civil Engineering and Construction, Cement, Power, Fertilizers, Real Estate, Expressways, Hospitality, Golf Courses, Sports and Education (not-for-profit). The Group has vast experience in the conceptualization, design, development, construction and operation of hydroelectric power plants and is able to manage multiple aspects of power projects, from front-end engineering design to completion, operation and maintenance. The Jaypee Nigrie supercritical coal-fired power plant consists of two units with generation capacity of 660 MW each. The plant was set up by Jaiprakash Power Ventures Ltd. (JPVL) at a site in Nigrie Village, Deosar Tehsil, Singrauli District in Madhya Pradesh, India. The commissioning for units I and II were carried out in 2014 and 2015, respectively. Yokogawa India successfully installed CENTUM VP production control systems and a high-fidelity operator training simulator with requisite project engineering and management, installation and commissioning services. Due to India’s rapid economic growth, power companies have not been able to keep pace with the country’s rising demand for electricity. To ensure a stable supply of electric power, the Indian government is planning as part of a comprehensive energy initiative to construct numerous large coal-fired power plants which operate at a temperature and pressure above the critical pressure point to generate steam for turbines with high thermal efficiency, consume less fuel, and emit less greenhouse gases. Such large supercritical pressure coal-fired power plants are also called super thermal power plants. Proven, unsurpassed reliability of Yokogawa’s control and monitoring systems help success of this government's program. The JPVL’s Jaypee Nigrie supercritical pressure coal-fired power plant consists of boiler-turbine-generator units employing supercritical sliding-pressure boilers supplied by L&T MHPS Boilers Private Limited*, steam turbines and generators by L&T, and the balance of plant (BOP) such as water treatment, ash handling and coal handling processes supplied and installed by various contractors including Ion Exchange, Macawber Beekay and L&T. * L&T MHPS Boilers Private Limited, India is a joint venture formed by Mitsubishi Hitachi Power System (MHPS) and Larsen & Toubro (L&T) and designs, manufactures and sells supercritical pressure boilers used in coal-fired power generation plants. Despite less environmental impacts, this type of plant has complex dynamic characteristics requiring quick responding control actions. Whenever the demand changes, the boiler combustion air, coal feeder speed and feedwater flow need to be modulated quickly in a correlated way in response, and the steam turbine also needs to respond in a coordinated manner. The CENTUM VP controls and monitors boilers and steam ensures that these controls work smoothly at all times whatever mode each unit is in. 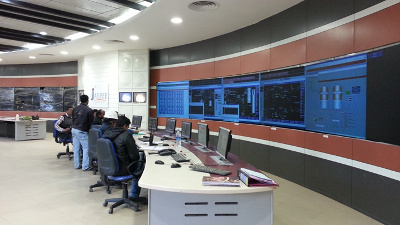 The comprehensive solution supplied by Yokogawa included proprietary full-replica operator training simulator in which the supercritical boiler (circulating corner firing with twin fire-vortexes design) and turbines used are modeled precisely to contribute to efficient operations throughout the lifecycle of this power plant.